This is an original C.W.S sign from their Crumpsall works. The sign ended up in Devon sometime in the 1980s. Was this sign from the original works? Do you recognise the sign? If you know anymore information about the sign, we would love to hear from you. Please email us at: historyme@inbox.com. C.W.S Crumpsall Biscuit Works sign. Courtesy A. Hiscutt . Manchester Bus Clipper Card from 1991. Courtesy D. Boothman. This is a Manchester bus service Clipper Card from 1991, which was launched in December 1979 by Greater Manchester Transport. 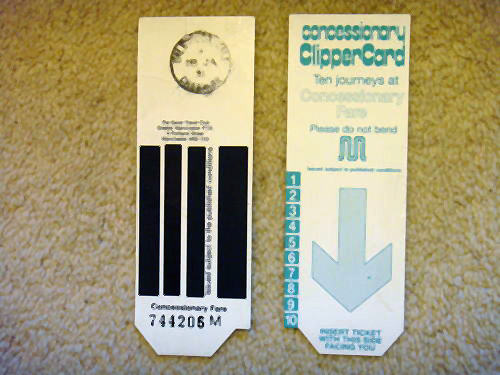 The Clipper Card offered 10 bus journeys for the price of 9, which the traveller would ‘clip-off’ in the self-cancelling machines which were installed on every bus. Almex M self cancelling ticket (Clipper Card) machine. Courtesy D. Boothman. There ease of use, convenience and offer of cost saving travel meant they became very popular throughout Manchester right up until they were replaced in 2004, when electronic recording of passenger journeys was brought in. The expansion of the school bus network also led to the demise of the Clipper Cards, coupled with a great shift for children to be driven to school by their parents, rather than using the bus service or indeed walking. The forced break-up of GM Buses by the Conservative Government in the 1990s also impacted greatly on the Clipper Card, as the UK Government wanted to streamline the system and essentially make more money from the bus services and so implemented their long held belief that privatisation rather than public ownership was the way forward. This built upon the Conservative Governments deregulation of the transport system in 1980 and the Transport Act of 1985, which took power and operations away from councils and local transport authorities and into private hands, the result of which has seen a monopoly of the system by a small number of companies and regular increases in fares above inflation.